Point-Box on card: 10 bonus points (you score points, when you play or use this card). Characteristics: HQ card, bonus points. The Mysterious Orb may be earned upon encounter by the personnel affected by this objective, but it may not be “returned to Bajor” for the card draw or points, because it cannot be “present” with that personnel on Bajor. See encountered, present, stealing. 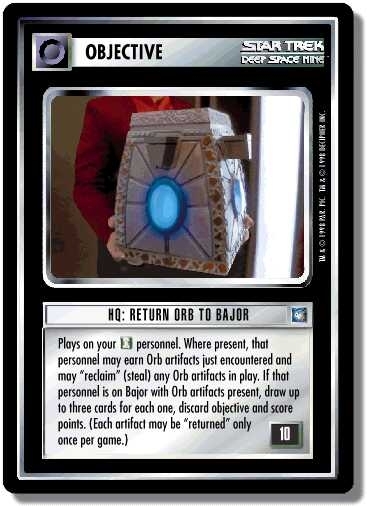 There are 33 entries for HQ: Return Orb to Bajor (ST1E 5 R 138) at the Tradeplace (26 haves and 16 wants). Click here to see all trade list entries for this Rare card!